MARK ALLEN crashed out of the Betfred.com World Championship last night before accusing Chinese players of cheating. 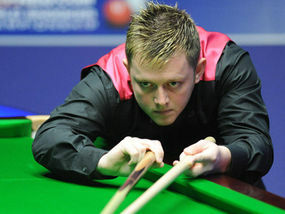 Northern Irishman Allen lost 10-6 in Sheffield to 21-year-old Crucible debutant Cao Yupeng, in his first year on tour. Allen has already been warned for comments this season about the Chinese, after insulting the host country and people at the Haikou World Open in February. And he will certainly attract more disciplinary action after an outburst over an incident in the 10th frame when he trailed 5-4. Allen accused Cao of a ‘push’ shot – touching the cue ball twice – and not declaring it as etiquette dictates. The ball appeared to touch the cue twice, but no foul was called by referee Paul Collier in what can be difficult decisions to spot for the officials. Allen said: “The big turning point was when Paul Collier missed a blatant push. It was obvious to me and anyone who was watching at home would have been able to see it. I am disgusted about what has happened. "If the referee had rightfully called a foul I’d have had a chance of going to 5-5 and the match would have been different, but he went on to pull away.